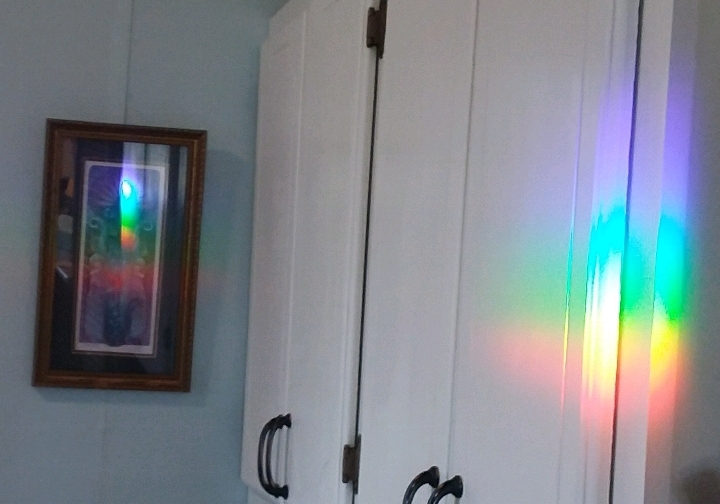 Love a day that starts with a rainbow and the way the prism throws it's colors different places as time moves inexorably forward. 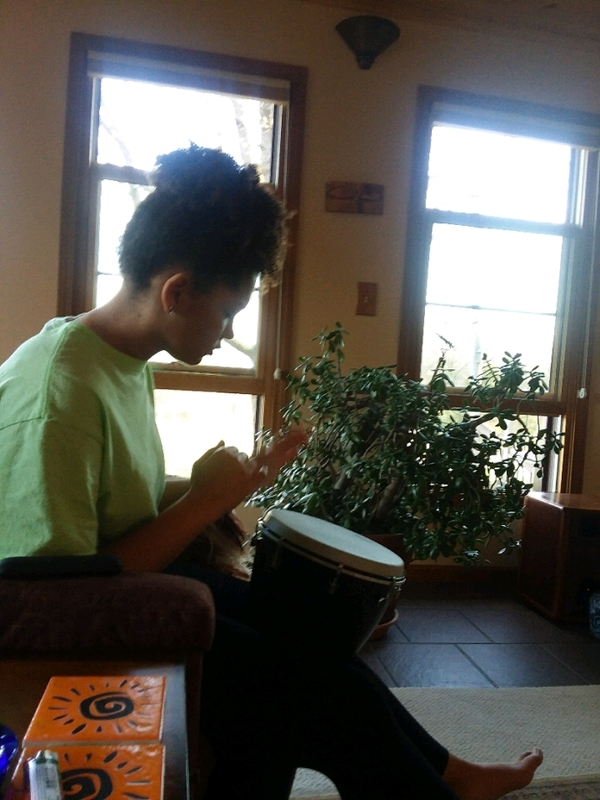 Had a good evening listening to Bob Marley while Anah played along and Erin danced. Got just enough rain yesterday that I hope the warmth of today's sunshine will wake up the collards and kale. Cutting and eating asparagus every day now. Husband says hostas are emerging so soon going out to pull back the leaf cover. 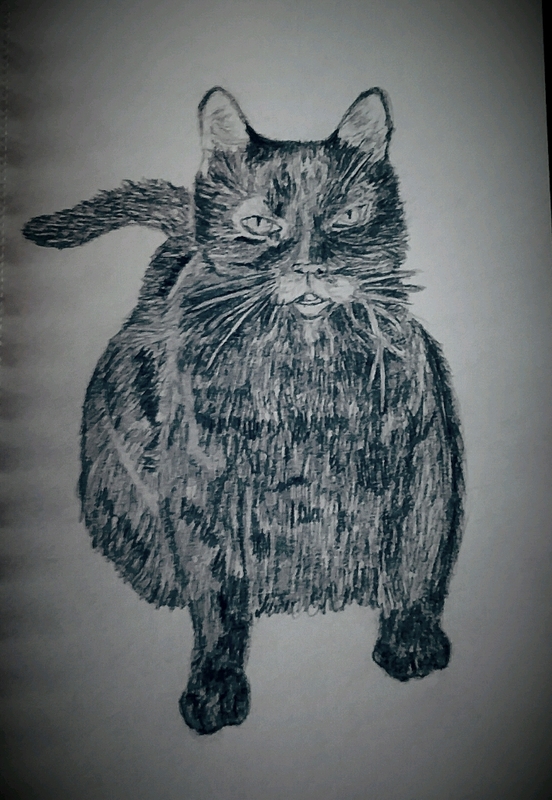 A sketch of Harold, my favorite feline. He will be 10 soon. If he lives as long as the Meezer, fabled feline of mallorys_camera, he and I might have a grand old age together. Btw, still using EFT, constantly finding new ways to apply it in my life and still pleasantly rewarded with relief. Made a marvelous omelet for breakfast, onions, eggs, ham, spinach and cheese. Now to proceed down the big hill to get a picture of the tree where the fairies live. Quick....before it gets too shady. What a chucky puss! It's great and I love his expression! He's rather smug about being top cat. Good for him. We are in a power struggle now as Patachou is starting to feel his oats. Titan isn't quite ready to step down yet. Most evenings, Harley who is 3 yrs. old challenges Harold who is 10. So far Harold has not relinquished his crown. They are amusing to watch though. Our one other cat is Lynx, who is one step away from feral, and Harley's mother. She just ignores the boys, wise female! I love omelets, they are one thing I will make when cooking just for me. 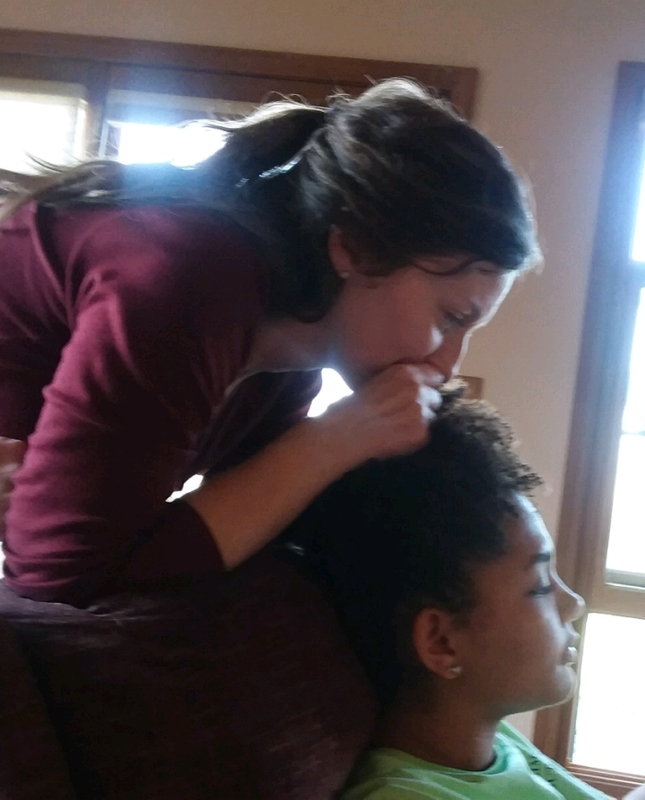 We have some great jam sessions in the living room. Harold makes a good subject. I find tapping works for me, too. Yes, twas a good day. Thanks, I enjoyed doing the drawing. Great to find someone else who has success with tapping, helps me get by. What a great sketch. He looks adorable.